I've spent the past four days in Vienna. While most of my vacation pictures are going up on the trip blog, I'm posting some of the crafting-relevant photos here. Some images will be blurry because they were taken in very low light conditions. The Schatzkammer contains the treasures of the Austrian Hapsburgs and in most sections, the light is kept very low to help preserve the textiles. Here are a set of christening gowns and blankets used in the baptisms of various royals. This features gold sequin designs. I need to read up on embroidery in the age of Maria Theresia, but I'd guess that this is tambour work of some kind. This set also features goldwork, only this time in padded stitches with couched pearls. Yeah, I'm in Austria again. Here are some photos of the window display of a bead shop in Salzburg. AAAARGGH! I'm working on a great project and I can't blog about it until June! This is driving me nuts! I'm going to write about it anyway and set the publish date for the wedding date. So, as a gift to my sister, I've offered to make her wedding veil. My plan is to make it match the dress she picked out, which has a lot of apple blossom motifs on it. The skirt is made of tulle and also has some of the apple blossom motifs on it. For the veil, I wanted to create a similar effect. After studying the petals, I was able to make a pattern and create my own flowers. 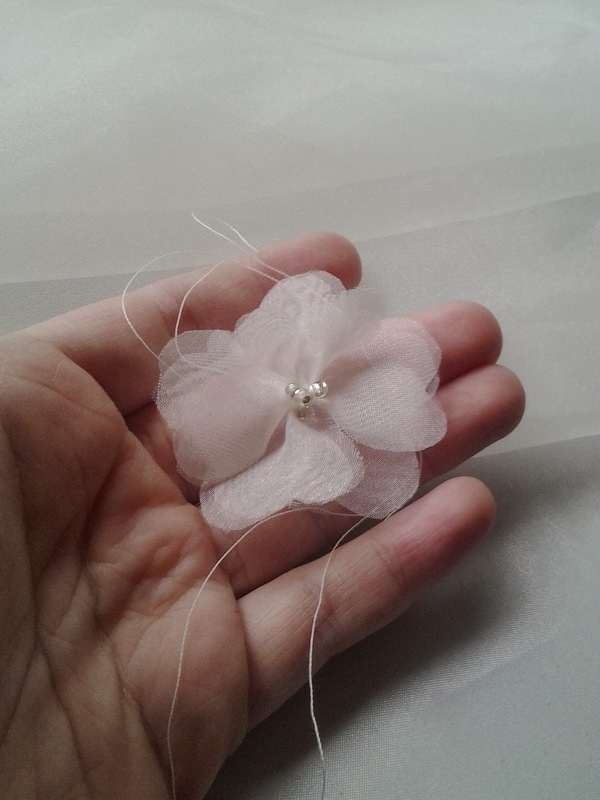 For the first flower, I was tracing each petal onto the organza with a fabric pencil, which was terribly time-consuming since organza is very slippery. This would not work. I made two copies of each petal pattern (there's a large and a small piece) out of Ultrasuede. By pinching pre-cut squares of organza between the pattern pieces and cutting around it, I could significantly reduce the amount of time it took to make a petal. Mom started helping me make petals and with some experimenting, we were able to cut five petals at once by stacking organza squares between the pattern pieces. With Mom and Emily cutting petals, and me sewing, we put together a little box full of flowers pretty efficiently. To wear the veil, I planned to gather the tulle to a hair comb. After experimenting with gathering the tulle straight across, we concluded that was too poofy. I cut one end of the length of tulle in a semicircle then rounded the corners of the bottom edge, gathering a portion of the semicircle to the comb. I decided the veil needed a little more sparkle so I added a beaded edging of size 11 silver-lined crystal seed beads around the edge. Three at a time. For a chapel length veil. Finished it at 3am the morning of the wedding. Here's the finished product. Everyone loved it. I'll have better photos available in about a month or so when my sister gets her professional photos back. I didn't have much time to do close-ups in good light but I know the photographer took some pictures of just the veil and the hair ornament before we got Emily into her dress.